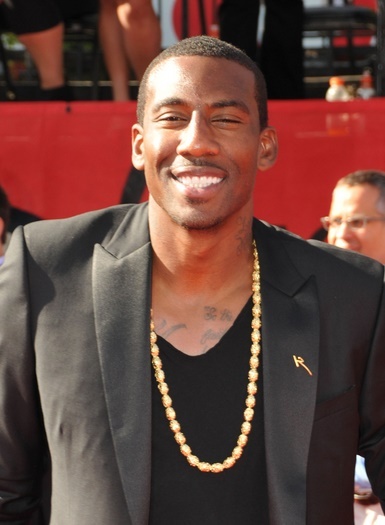 Place of Birth: Lake Wales, Florida, U.S.
Amar’e Stoudemire is an American basketball player. His parents, Carrie (Palmorn) and Hazell Stoudemire, are both African-American. He is married to Alexis Welch, and has five children. Amar’e’s maternal grandfather was named Jack Palmorn (the son of Joe Palmorn). Jack was born in Georgia. Amar’e’s maternal grandmother was named Bessie Bell Thomas. Both of my parents come from a Hebraic background… My family are Hebrew Israelites descended from the Kingdom of Judah. Amar’e’s maternal grandparents, who were African-American, were of the Baptist religion. It does not appear that Jewish ancestry has yet been verified/documented for Amar’e Stoudemire. It is not clear if he has (yet?) converted to Judaism. This is more of a question rather than a true correction. Should this line “It does not appear that Jewish ancestry has yet been documented/verified for Amar’e Stoudemire” be stricken from this profile? If he claims to be a Hebrew Israelite, I’m pretty sure that he meant he’s a Black Israelite. If that’s the case, there will never be a record of his ancestry to support that claim. Instead of me explaining why that is, I suggest a moderator to look into their history for him and/or herself. Either way I feel like the wording should be changed. That statement seems to suggest otherwise. But w/e it’s your call. Yes, Stoudemire went from generic Jewish ancestry in the early 2010s to more ambitious comments like that one more recently. I don’t think his parents nor his grandparents were Black Hebrew Israelites. Speaking of Judaism follers are you 100% confident Anthony Rapp, Abigail Breslin,Aalessandra Torresani, Whoopi Goldberg, Jimmy Carter, and Charlie Sheen have no recent Jewish ancestry? I would say 100% for Torresani, Goldberg, Carter, and most probably Rapp. How did Carter get involved in this, anyway? He wouldn’t be my first choice for the first Jewish president. It’s just that, it doesn’t appear to be publicly known if Stoudemire has officially converted to Judaism. I have never heard him say “I have Jewish ANCESTRY on my mother’s side” He has only said that he is Jewish and practices Judaism. If he says he practices, then you can assume he does. The media does not document the beliefs of all athletes. He is, in his words, “culturally Jewish,” an immersion that included a “Hebraic wedding” in 2012, observance of Jewish holy days and ongoing plans for Israeli citizenship. Why? Has anyone found his Jewish ancestry, or is there any evidence that he has actually converted to Judaism? Futhermore, also from the article, he said he has ancestors that were Jewish, contradiction….